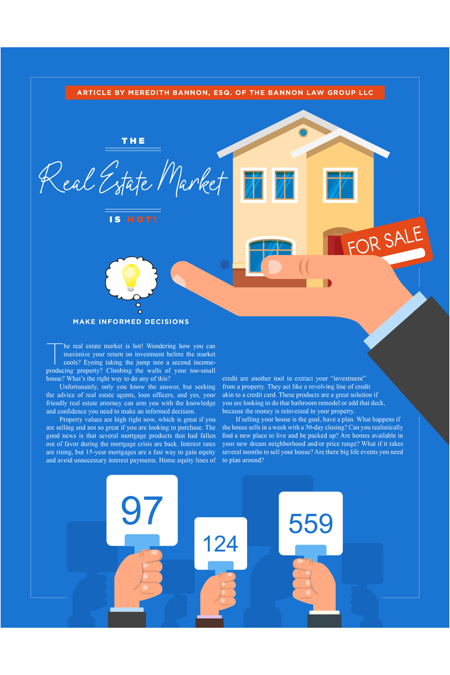 The real estate market is hot! Wondering how you can maximize your return on investment before the market cools? Eyeing taking the jump into a second income-producing property? Climbing the walls of your too-small house? What’s the right way to do any of this? Unfortunately, only you know the answer, but seeking the advice of real estate agents, loan officers, and yes, your friendly real estate attorney can arm you with the knowledge and confidence you need to make an informed decision. Property values are high right now, which is great if you are selling and not so great if you are looking to purchase. The good news is that several mortgage products that had fallen out of favor during the mortgage crisis are back. Interest rates are rising, but 15-year mortgages are a fast way to gain equity and avoid unnecessary interest payments. Home equity lines of credit are another tool to extract your “investment” from a property. They act like a revolving line of credit akin to a credit card. These products are a great solution if you are looking to do that bathroom remodel or add that deck, because the money is reinvested in your property. If selling your house is the goal, have a plan. What happens if the house sells in a week with a 30-day closing? Can you realistically find a new place to live and be packed up? Are homes available in your new dream neighborhood and/or price range? What if it takes several months to sell your house? Are there big life events you need to plan around? If you sell your house, the biggest closing expense will be the Realtor commissions—the seller pays both Realtors, who are worth every penny. If you don’t trust yourself to sell your Beanie Baby collection online for its maximum value, why on earth would you try to sell your house on your own? It is important to realize that you are in the business of selling your home, and a great Realtor can help make that business succeed. South Carolina land sales carry a deed stamp tax of $1.85 per thousand dollars of sale price (do that in your head real quick! ), and Hilton Head Island is the only municipality in the state to have a municipal transfer fee at one quarter of 1 percent of the sales price—at least until the statute ends in 2024. Other seller expenses are the CL-100, which is the inspection for active mold, fungus and termites, seller attorney’s fees, mortgage payoff and any repairs not paid for prior to closing. If your property is in a gated community/plantation, find out before you accept any offer if there is a transfer fee or upcoming insurance assessment (no more hurricanes, please!). These can be hefty and used as a bargaining chip in contract negotiations. Listen to your agent and do all repairs to bring your property into good shape. Doing so will not only help in your final sale price, but it may save you from large repair coordination and bills while trying to move and/or prevent ruining the deal. Once the seller is made aware of a defect, they must disclose that defect to any subsequent buyer. This means, if it comes up and you are negotiating repairs, even if you cancel the current sale, you’ll have to let any subsequent purchasers know about it. This is why doing needed repairs prior to listing your house and going under contract can literally save you thousands of dollars. Hooray! You have a contract! Smooth sailing, right? Not so fast. Most contracts have an inspection period where a licensed home inspector can inspect and report on his findings regarding the condition of the home. If you have done repairs prior to listing the house, there shouldn’t be much apprehension. Do not try to hide any abnormal wear and tear, as that could come back to haunt you in the form of lawsuits for years to come. Often, the purchaser will have a financing contingency which allows a period of time for the lender to either approve or disapprove the loan. If the loan is denied within the financing contingency period, the purchaser normally receives a refund of the earnest money deposit, the contract is cancelled, and the seller has to relist the property. Sometimes, the lender denies the loan because the debt-to-income ratio is too high for the purchaser, the purchaser has lost his or her job, or the loan is otherwise too high-risk. None of these things can you, sweet seller, control. However, sometimes the sale gets gummed up over a low appraisal whereby the lender assesses that the house is worth less than the purchase price. In this situation, either the contract can be cancelled, the purchaser can scramble to find the difference in funds, or the seller can agree to lower the sales price. Each situation is different. However, if the seller makes sure to keep the house tidy, well-maintained and in good repair, the likelihood of the house failing to pass inspection or appraise for the sales price is lessened. Now, 98 percent of your work is done! We do not do table closings in South Carolina. On or before the day of closing, the seller meets with his or her attorney and signs a deed, federal withholding affidavit, a state withholding affidavit and a lien affidavit. The purchaser’s attorney prepares a settlement statement, and the seller’s attorney reviews all the fees with the seller. Then, profit! The take away? If you have the sale itch, good! You have many options, but gather your team to get yourself and your property game-day ready. Your lender, Realtor, insurance agent, accountant and lawyer all want to provide as much information and support as necessary to make wise investments, because when clients make informed decisions, they are clients for life. Meredith Bannon is an attorney with Bannon Law Group located at 10 Westbury Park Way, Suite A, Bluffton, SC 29910. For more information, visit bannonlawgroup.com, or call (843) 815-4505 to set up a consultation. To contact Meredith directly please email meredith@bannonlawgroup.com.